Concrete is naturally porous. Both new and old concrete can have elevated relative humidity (RH) within the slab. 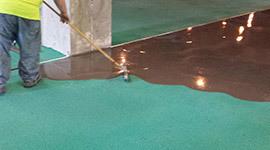 This moisture travels through concrete floors to the surface, resulting in bubbling, blistering, and delamination of floor coatings and floor coverings alike. Black Bear Coatings & Concrete has extensive experience with vapor mitigation techniques that can prevent this from happening. We understand how to apply chemical underlayments that prevent water vapor from passing through concrete slabs. Both cementitious and resinous underlayments are options for vapor mitigation. Some situations can be addressed solely with a primer, while others require both a primer and cementitious topping. Our experts can determine which products are best suited for your needs, as well as what type of substrate preparation will be needed so the underlayment will bond tightly to the concrete. Preparation is one of the most important factors for the successful installation of underlayments for vapor mitigation.